A motive or phrase is ornamented by adding one or more notes between some of the notes in the original motive or phrase. The term “ornament” originated during the Baroque Period. Instead of writing out the notes that defined the ornament, composers would place something like clip art above a note to indicate that the note was to be embellished with specific tones. These Baroque clip art stickers were called “ornaments”. Usually ornaments are quick successions of tones that embellish the melody note. A melody is not defined by its ornaments. Strip away the ornaments and the melody would not be damaged. Triplets can be thought of as an ornament. In Celtic music the “roll” is an ornament. 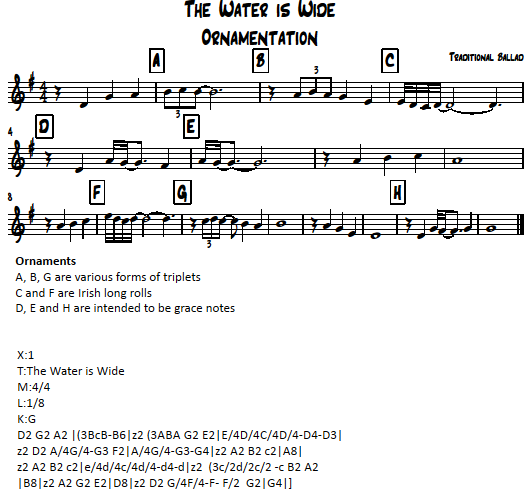 Explore this ornamented version of The Water is Wide. The number of ornaments in this piece is way beyond good taste. So many were placed in the score solely for the purpose of demonstration. Ornaments are seasoning. They are not the food of a musical dish. Too much decoration will wreck an otherwise good composition.